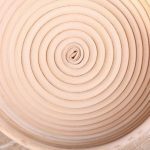 You are here: Home / WKB projects / Pain Rustique…practice makes perfect! We are still baking like crazy with our Rofco bread oven. This little box works miracles for bread. The hot stones make the bread live, open up, and rise till the roof! All the heat which is stored in the big stones is transmitted directly through the bottom of the dough turning it into bread. The bread will ‘grow’ during the first 8 minutes of its still short life, then it settles and starts changing into a golden loaf of bread. During the final fase of birth the bread crumb heats up and sets solid, while evaporating about 10% of the water of the dough. The baker has to make a decision; when is the bread done? 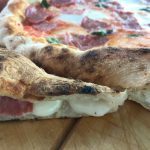 Get it out to soon and you end up with soggy crumb and a soft crust. Waiting too long and the crumb will dry out and turn into dry cotton. A tough decision, only trial and error will learn you the moment which is right for this particular recipe and your particular oven! 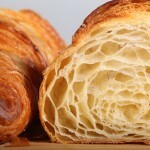 This is why I keep getting back to the pain rustique. 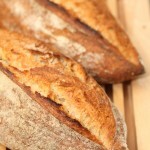 I have baked about 80 pain rustique breads and with each I learn something new. It learns me how to handle and shape the fluffy delicate dough into nice evenly shaped breads. It teaches me when to stop the final proofing and when the bread is ready for the oven. When you ‘over’ proof the dough it loses all elasticity and will not expand any more when put into the oven. When you under proof you will end up with a compact crumb. When the final proofing time is right, the dough will expand during the first 8 minutes and when slashed the right way with a sharp razor knife, you end up with a nice burst pattern; the ‘ear’ of the bread. I keep experimenting with the baking time to get a nice balance between the moistness of the crumb and the crustiness of the crust. 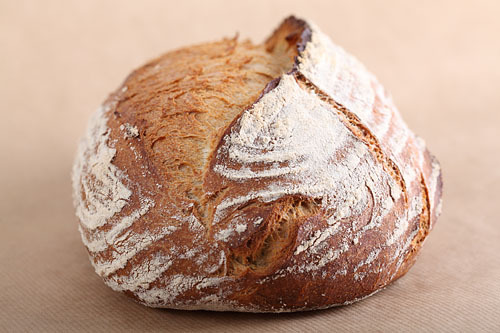 When the bread cools on a wired rack, the heat and water damp moves from the centre of the bread through the crust. This process ruins the dry crust, as the crust holds some of the moist transferring from the centre of the bread and softens in the process. A few minutes of final baking time makes or breaks the balance between the structure of the crumb and crustiness of the crust. So pick one or two nice recipes and bake them again and again until you can make the perfect loaf with your eyes closed! I make notes into my little black book each time I change something so I will not forget them for the next baking session; the proofing time, the amount of water, the amount of salt, the changes in kneading time, the temperature of the room etc. I picked the recipes from Jeffrey Hamelman’s book ‘Bread’; the pain rustique, the whole wheat pain levain and the 70% rye bread. 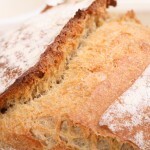 I have modified and tweaked the recipes for my oven, my wheat and my taste. I use a rye sourdough starter for the poolish pre-ferment of the pain rustique instead of commercial yeast. This adds even more taste and a little background sourness to the bread. I use 10% spelt in my whole wheat pain levain and I add some large raisins into the 70% rye bread! Maybe you can give it a try. Or else we can work something out and you can get some of our starter. 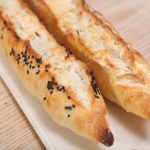 Albert Heijn heeft ook een ‘Pain Rustique’ in haar assortiment. Helaas kan het de vergelijking met het echte werk niet doorstaan. Het blijft een industrieel gemaakt brood, hoe mooi de woorden op de verpakking over ‘onze bakkers’ ook klinken. Maar wel een hele verbetering ten opzichte van de rest van het fabrieks-afbakbrood dat je daar aantreft en wat voor vers moet doorgaan. Dank je! Ik zal ze daar bestellen en me laten inspireren door jouw prachtige foto’s en overheerlijke recepten! That sounds like a good idea! Love to hear from you. Wat leuk dat je onze site bezoekt! Je ziet wel dat we tegenwoordig veel met brood bezig zijn. Erg leuk om te doen en sinds we onze steenoven hebben gaat het echt fantastisch! Deze taartjes zijn echt geweldig lekker. Als je ze niet zelf wilt of kunt maken zijn ze ook te koop in Amsterdam in de Haarlemmerstraat 111A bij de Portugese winkel Casa Bocage. Ik heb ze pas op en ze waren ook heel lekker. Ze leken behoorlijk veel op de taartjes van het recept. Veel plezier ermee en laat ons weten hoe je het vond! als je de link aanklikt krijg je een foutmelding. Heb je voor mij misschien het recept. Ik heb al verschillende recepten van je uitgeprobeerd en ze waren allemaal heerlijk. Groeten van Anja van Raay. Not only your recipes, but also your pictures and lay-out of your blog. I follow your blog for some time, though irregularly. What happened with the brilliant lay-out with the vertical row of icons? I would be very interested to learn if this was a wordpress theme? We have created a little bit of an enthusiastic following for our bread at the moment so the distribution among family, friends and colleagues is no problem at all. We like it that they all like our bread and raisin buns so much so it’s a bit of a positive little circle of baking – compliments – more baking – more compliments etc..
2 posts ago, I made my 1bread: a white organic home made kefir bread!! !